This is a 2D shooting gallery. 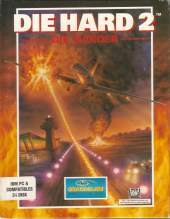 In the early 90's, two things just wouldn't die: Bruce Willis in the Die Hard trilogy of movies, and, well, 2D point-and-click shooters. Based on the 1990 movie Die Hard 2, the program sends you through five stages modelled after key scenes of the film. As N.Y. cop John McClane, you have to shoot terrorists invading Washington's Dulles airport by quickly aiming a crosshair at them. You’ll successively clear the luggage center, airport annexe and runway, then chase after the bad guys on a snowmobile and finally shoot it out on the wing of the terrorist's plane. Each stage consists of three screens; on the last one, several tougher bosses will appear. Occasionally, civilians cross the room and pray that you don’t kill them. Most dying terrorists drop power-ups, namely med-kits, armour, grenades and weapons that are more powerful or fire faster. You collect these items by shooting them in time. If you do not aim fast enough, the terrorist's bullets will drain your health; you may die three times, but after that, John McClane bites the dust once and for all. Until you restart, that is.